WMWA’s Pledge to Plant campaign is in its second year and has so far resulted in hundreds of people pledging to convert turf or hard surfaces to native plants. Planting even a small section of your yard with natives can have lasting benefits including less maintenance - like less watering, no mowing, less pesticides, and less fertilizers. Plus, native plants have longer roots that hold the soil together, reducing erosion and allowing rain water to soak in rather than run off into storm sewers. Finally, native plants increase biodiversity and can be an important food source for bees, butterflies, and other pollinators – which can use all the help they can get right now! Watch for WMWA’s Pledge to Plant banner at your local event. Additionally, and log on to take the pledge and add your name to the list of those choosing natives. Thanks to students from The Blake School, visitors to the Bassett Creek Watershed Management Commission (BCWMC) website can now take a virtual tour of four of the watershed’s management projects. These projects help improve water quality and habitat in the creek. In a first of its kind collaboration, photography and environmental science students from The Blake School in Minneapolis worked with the BCWMC staff and city staff from New Hope, Golden Valley and Minneapolis to create the interactive photographs. The production work for the project began in September when students and teachers from The Blake School visited sections of Bassett Creek in New Hope, Golden Valley and Minneapolis. 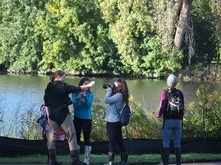 During the field trip, photography and science students worked together to learn about and photograph the water management projects and other key points in each area. Back at school, students performed more research, including gathering historical and scientific information, to create a unique product full of photos and information. At each location students used a 360-degree camera to photograph the entire site. This allows online viewers to “spin around” in a circle as if standing in that location. Photos of plants, animals, or objects at each project area are linked within the 360-degree photo, along with text describing the object of the photo. The end result is an interactive photograph that allows the viewer to take a virtual tour of the project and information on key aspects of the area. Bassett Creek main stem erosion repair project near the historic Fruen Mill along Glenwood Ave.
Last year, the City of Plymouth and the Elm Creek Watershed Management Commission (ECWMC) collaborated on extensive restoration of streambanks and pollution reduction measures along Elm Creek in Plymouth. The project extends north of Wayzata High School and east from the former Elm Creek Golf Course to Peony Lane. The project includes a number of different best management practices aimed at reducing pollution and improving habitat in and near the stream. Eroding streambanks were stabilized and repaired – often using logs and woody materials from nearby trees that were removed to allow access for equipment and to open the area to sunlight. Rock structures were put in some sections of the stream to slow water flow and direct the water’s energy away from the banks. In addition, riparian areas near the stream were improved and planted with native vegetation to add wildlife habitat value. Finally, the project included the installation of iron-infused filters adjacent to two water quality ponds. When storm water comes in contact with iron, phosphorus in the water becomes bound and held in place, making the exiting water less laden with algae-feeding nutrients. In addition to improving water and habitat, a Wayzata High School student took advantage of the opportunity to further enhance the project by adding public educational signage for the site. Overall, this project will prevent an estimated 185 pounds of phosphorus each year from entering Elm Creek. It was partially funded by a grant from Hennepin County and will be maintained by the City of Plymouth. The Steinke Family farm in the Pioneer-Sarah Creek Watershed has been in the family for almost 80 years and now sits at the edge of suburban development. Last summer, the Steinkes made some simple but effective improvements to their barn yard that will reduce polluted runoff from entering streams and wetlands. By taking advantage of a nearby road project, gravel material was laid over the 1-acre barn yard, turning it from a muddy mess into a level, hard surface. This makes it easier to scrape manure to use as fertilizer on fields and prevents it from running off into nearby bodies of water. The hard surface is better for the cattle, too, as they stay clean and dry. In addition, a water diversion and inlet structure was installed to gather the water before it even gets to the barn yard. Now water runs underground to an outlet on the far side of the yard, preventing a large volume of storm water from washing over the yard and carrying manure and phosphorus downstream. Gutters were also added to a nearby shed to divert even more rainwater away from the yard and to further reduce the amount of runoff. It’s estimated that this relatively simple project will reduce phosphorus runoff by more than 750 pounds per year. It was completed with design assistance from the Hennepin County Environment and Energy Department and the University of Minnesota – Extension Service. Tuesday, February 21 from 8 a.m. - 2 p.m.
Join us for the cleanup event and Public Works Open House! With the addition of a Public Works Open House this year, you will be able tour Brooklyn Center's maintenance facility, get an up-close look at the vehicles and equipment, learn about the benefits of rain gardens, and visit booths from local groups to learn about protecting our streams, lakes and wetlands. After touring the facility, we invite residents and visitors to help collect trash from around the area. Access to the city’s trail system is right outside the backdoor. Many groups affiliated with Brooklyn Center Adopt-A-Park/Trail/Street Program will use this opportunity to kick off the year cleaning up their assigned sites during the week. Your efforts to help throughout the week will be greatly appreciated and will help make this year’s Earth Day event a great success. Trash bags and gloves will be provided to volunteers. The event will proceed rain or shine. If you have questions, contact Public Works at 763-585-7100. May 8 - 9 from 7:30 a.m. - 4 p.m. This course is designed for those who inspect, maintain or direct maintenance on stormwater control measures and practices, such as ponds and infiltration systems. Attendees will learn the fundamentals of stormwater practices, processes, mechanics, operations, inspections and maintenance needs. They will also learn how to create and execute a maintenance work plan. Learn more. Excerpts from a blog post by Nick Busse with the Mississippi Watershed Management Organization. Reprinted with permission. I was recently cleaning out my garage and came across a container of a certain “environmentally safe” ice-melt product. I bought it years ago — long before I started working in the watershed world. At the time, I probably thought I was being a responsible consumer, buying some premium-quality pellets that could melt the ice on my sidewalk without creating needless pollution. What I know now is that there is no such thing. All road salt and deicer products create pollution. They’re bad for plants, animals, water quality — not to mention buildings, bridges, clothes and your front doormat. More to the point, salts and many deicers contain chloride, which is toxic to things that live in our rivers, lakes and wetlands. In Minnesota alone, 47 waterbodies and groundwater supplies are already known to be impaired for chloride. Most of this comes from the salt and deicers that MnDOT, cities and counties use to keep ice off of our roadways. Salting our roads is a deal with the devil. There’s no question that it cuts down on ice and makes it easier for us to get from point A to point B in the winter, but we pay a big environmental price for it. Chloride is virtually impossible to remove from a waterbody. In the spring, when the snow and ice melts and all that salty runoff washes down the storm drains, it ends up in our rivers and lakes and stays there — permanently. It doesn’t take much salt to create a problem, either. Just one teaspoon of salt is enough to pollute five gallons of water forever. In recent years, public works agencies have begun providing new training and tools to help their snow plow crews apply salt and deicer more efficiently. These “smart salting” techniques are helping to minimize the environmental impact of chloride without compromising safety on our streets and highways. 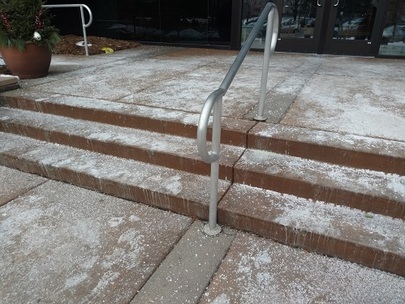 Winter maintenance professionals in the private sector are also learning these techniques, and the Minnesota Pollution Control Agency maintains a list of smart-salting certified contractors. You can do your part to prevent chloride pollution by following these simple tips when maintaining your sidewalks and driveways this winter. Shovel and scrape first. The best way to remove snow and ice is the old-fashioned way: with elbow grease. Shovel early and often during a snowstorm so that the snow doesn’t have time to become compacted and/or turn to ice. If it’s too cold, don’t use salt. Before you do anything, check the temperature. Salt and deicers only work in certain temperature ranges. Traditional road salt (sodium chloride) doesn’t work below 15 degrees F. Other products made of magnesium chloride, calcium chloride or urea have different melting temperatures, but the bottom line is that if it’s too cold, none of them will work. Use sand to provide traction. If you have a walkway covered in ice and it’s too cold for your salt or deicer product to work, you might be better off using sand. Sand doesn’t melt the ice. Instead, it sits on top of the ice to provide traction. If you must salt, use as little as possible. This is where all the salt goes: right down the stormdrain and into the nearest lake or river. If you’ve cleared away all the loose snow and ice and it’s warm enough for the salt to do its job, then go ahead and apply it. Just remember that more salt does not equal faster melting. One pound of salt is approximately a 12-ounce coffee mug. Use (less than) 4 pounds of salt per 1,000 square feet. Attend a training course or send your snow removal professional. Private contractors hired to remove snow and ice from sidewalks and parking lots should attend a training session. The Mississippi Watershed Management Organization is hosting “Parking Lot and Sidewalk Winter Maintenance with Reduced Environmental Impacts Training” on Tuesday, February 21. Learn more and get registered.